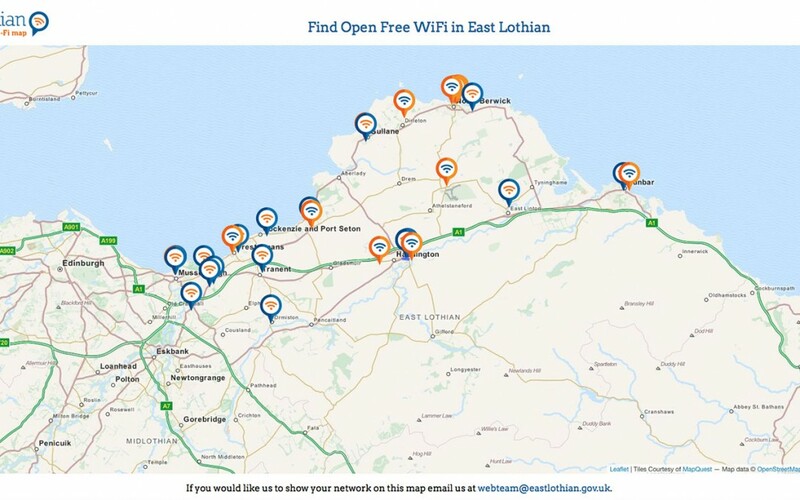 East Lothian Council web and communications team have recently developed a ‘Free WiFi in East Lothian Map’ as part of their digital inclusion strategy. The map is a way to help all residents and visitors to the county get online and gives details of where in East Lothian there are free Wi-Fi spots on an easy to use map and how they can be accessed. The map currently includes all council buildings which provide free Wi-Fi, as well as businesses and other hotspots around the county. We are trying to spread this information as widely as possible to ensure that everyone is included and can contribute effectively and easily in the digital age. Businesses and other groups are also encouraged to contact us if they would like to be added to the map. More details can be found here.